I went down to the bog today, camera in hand, for a little professional development. 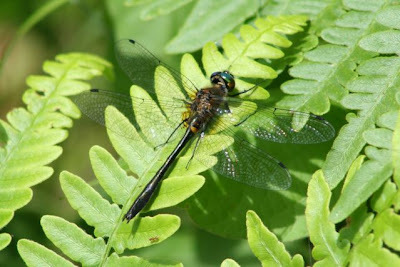 I need to work on my dragonfly ID. The first I came upon was a male Common Whitetail. I only got this one photo before it flew off. 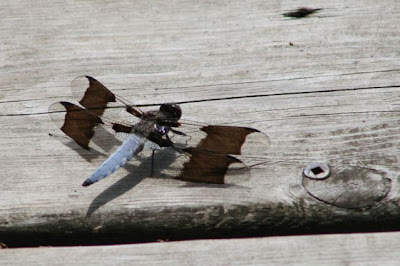 I then immediately saw a very different dragonfly. As you can see in this second photo it looks different but it is actually the same species. This is a female Common Whitetail. 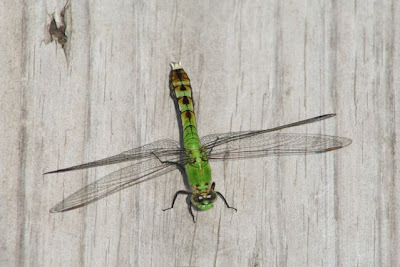 Next up was this Eastern Pondhawk. I photographed one in the bog a few years ago as well. It is a common resident. This one was actively chasing or "hawking" some species of what I think was a bee fly. Very close by I spotted this immature male willow skimmer. It is hard to tell an immature male and a female apart but you can see some white smoky color appearing in the wings just to the outside of the black patches. On an adult male these patches are more apparent and the abdomen will turn gray. 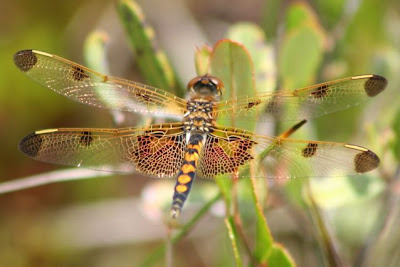 The next species I spotted was a Calico Pennant. It can be identified by the yellow heart shapes running down the abdomen. Since the hearts are yellow this is either an immature male or a female. They would be red on a male. The yellow stigma (that's those solid yellow rectangles on the leading edges of the wings) though tells me that this is a female. They would be red on a male. The next one isn't the best picture as I could not get a good shot of the abdomen. 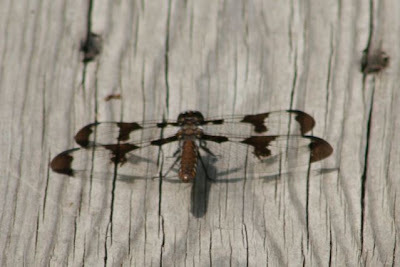 It is a juvenile or female twelve spotted skimmer. It isn't possible to tell them apart. It looks a lot like a female common whitetail shown in the second photo of this post but as you can just barely see in this photo the lateral yellow stripe on the abdomen is continuous whereas on the common whitetail it is a broken yellow line. The sixth species I spotted was interesting in that it was the only species that returned to a perch as it hunted. 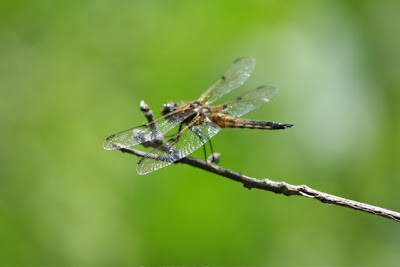 I couldn't get a good shot from the boardwalk so I crawled out on a log in the moat and simply waited for the dragonfly to return to the perch. 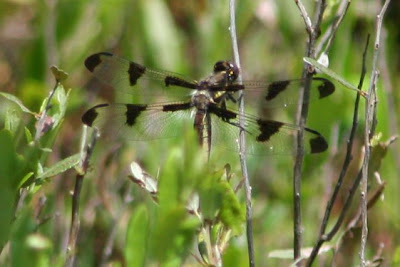 It still isn't the best diagnostic shot but this is a four spotted skimmer. 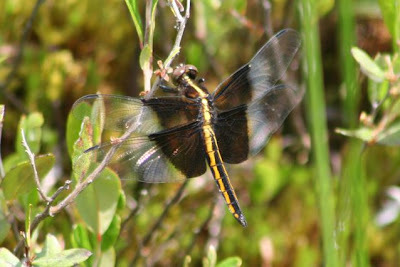 The last dragonfly I saw in the bog was a really cool one. It flew so different than the others. It was a Racket-tailed emerald. The two yellow semi-circles at the top of the abdomen are diagnostic. To be really dorky, I can show it is a Racket-tail emerald for sure because the triangle in the wing shown below has no veins though it which is also diagnostic of this species. That's not something you can spot as it flies by! Well, not too bad for a short hike though the bog!